Reba McEntire and Narvel Blackstock purchased a home in Lebanon, Tennessee, just outside of Nashville soon after their marriage in 1989. The former couple spent most of their time at their massive Beverly Hills home, which they purchased in January of 2003. Reba McEntire's Beverly Hills home. Reba and Narvel's Beverly Hills home which was built in 1993, has six bedrooms, seven bathrooms, 9,242 square feet, and is worth roughly $10 million. Since the purchase, they have added a guest house, tennis court, putting green, and a swimming pool to the property. It seems Reba and Narvel's love for tennis and swimming may have started in Lebanon, Tennessee. 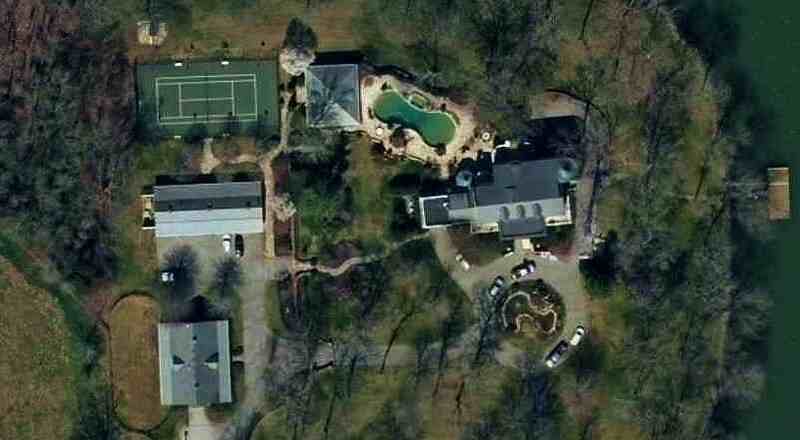 Their suburban Nashville home, situated on the Cumberland River, also offers a tennis court and swimming pool. This home is currently for sale. http://wilsonpost.com/rebas-starstruck-farm-for-sale-cms-88872". Reba McEntire's Lebanon, Tennessee home. Reba McEntire released the album Reba: Duets in September of 2007, where she partnered with LeAnn Rimes, Ronnie Dunn, Kelly Clarkson, Rascal Flatts, Trisha Yearwood, Carole King, Kenny Chesney, Vince Gill, Faith Hill, Justin Timberlake, and Don Henley.